At the time of his death, Erle Stanley Gardner was the best-selling American author of the 20th century, and world famous as the creator of crusading attorney Perry Mason. 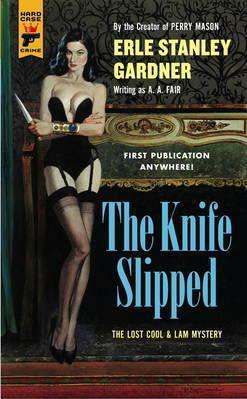 Gardner also created the hardboiled detective team of Cool and Lam, stars of 29 novels published between 1939 and 1970 -- and one that's never been published until now.Lost for more than 75 years, THE KNIFE SLIPPED was meant to be the second book in the series but shelved when Gardner's publisher objected to (among other things) Bertha Cool's tendency to "talk tough, swear, smoke cigarettes, and try to gyp people." But this tale of adultery and corruption, of double-crosses and triple identities -- however shocking for 1939 -- shines today as a glorious present from the past, a return to the heyday of private eyes and shady dames, of powerful criminals, crooked cops, blazing dialogue, and delicious plot twists.